THE ONLY FORSKOLIN BACKED BY SCIENCE:ForsLean® is the ONLY brand of forskolin proven in clinical research studies to be safe and effective. 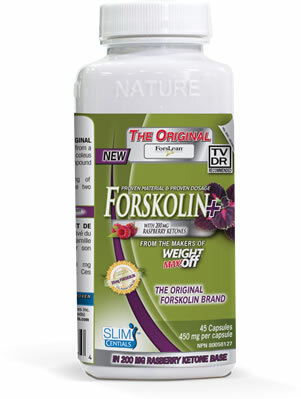 forskohlii and is standardized for a compound called forskolin. Forskolin Nx™ also includes 200 mg of Razberi-K® raspberry ketones. These two nutrients work together. Recommended Dose: Take 1 capsule two times per day. Recommended Duration of Use: Consult a health care practitioner for use beyond 8 weeks. Recommended Use or Purpose: Source of antioxidant. I have just finished my first bottle of Forskolin. This is a great product and it is working well with Weight Off Max and Raspberry Ketones. Forskolin helps increase my metabolism and burn more fat. I have lots 2lbs already and look forward to losing more. Q: what is the best time of day to take dosage ? A: The best time to take the SlimCentials Forskolin+ is 30 minutes prior to your two largest meals with a glass of filtered water. On days that you exercise, position one of the two servings 30 minutes before exercise with a glass of filtered water. By taking it before exercise, the product helps you preserve lean muscle while also encouraging you to enter a fat burning zone faster! A: The recommended dose is to take 1 capsule two times per day. 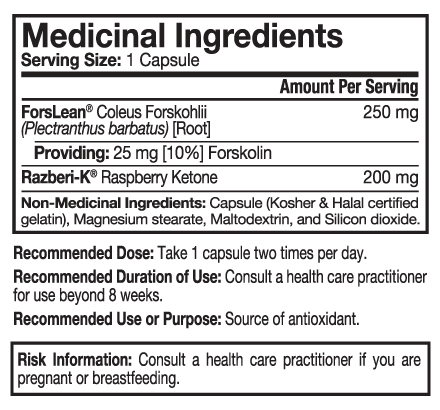 The SlimCentials Forskolin+ has 250 mg of Forslean standardized for 10% Forskolin (25 mg) which is taken twice a day. This is the exact material used in the studies that show successful weight loss results. To read about the study done on Forskolin more please see link below.